Gamma World takes place in the mid-25th century, more than a century after a second nuclear war had destroyed human civilization. The war that destroyed civilization in Gamma World is only vaguely described in most editions of the game, and what details are provided change from version to version. The first two editions place a first nuclear war near the end of the 21st century, with the final war in the years AD 2309-2322, and ascribe the final annihilation to a terrorist group called "The Apocalypse" and the ensuing retaliation by surviving factions. Later versions would radically alter the reason for the collapse. The 2000 Alternity version is die to alien arrival and nuclear response. The 2003 d20 Modern iteration is due to rampant use of nanotechnology and AI. The 2010 edition introduces a radically different comedy backstory that attributes the destruction of civilization to the activation of the Large Hadron Collider, which caused multiple realities to exchange features in an event known as "The Big Mistake". All editions, however, agree that the cataclysm destroyed all government and society beyond a village scale, plunging the world into a Dark Age. In many editions of the game technology is at best quasi-medieval (in the first edition, the crossbow is described as "the ultimate weapon" for most Gamma World societies). Some, such as the 2003 and, to a lesser degree the 2010 edition, feature advanced technology that is well known and often easily available. Whereas earlier editions had ancient super-science artifacts as risky to use due to the average Gamma World character not knowing how to properly operate such devices. Or not even knowing what the device is at all. 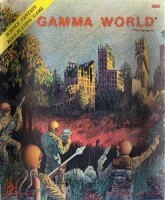 The post-apocalyptic inhabitants of Earth now refer to their planet as "Gamma World" (or "Gamma Terra" in later editions). I started playing Dungeons & Dragons back in 1978 when I was 7 years old. Some older boys down the street taught me to play, and the oldest brother was our DM. He had most of the TSR games that were available, and I instantly fell in love with Gamma World! Gamma World was similar to D&D, except instead of being set in a magical realm of swords and sorcery, it was set in a dystopian future of radiation and ruin. Laser guns were common, and you could be a Pure Strain Human (resilient, but boring), a mutated human, or a mutated animal. The original module was “Legion of Gold”, but I seem to remember more about “Famine in Far Go”, and I believe there were giant radioactive chickens. I admit, we played D&D much more than we played Gamma World, but it has always held a special place in my heart. I haven’t played any of the newer versions, but based on the popularity of the latest edition of D&D, I hope that it gets another re-issue soon. It seems that the latest edition was made in 2010 by Wizards of the Coast and came with cards of some sort, so it seems to have changed considerably from the old pen and paper version that I grew up with. Pros: Fun and different for people who tire of elves and dragons. Cons: Not as much support as D&D. Add a Review for "Gamma World"